"I Like It Like That" Is How NYC Theater Got It's Mambo Back! … in my personal opinion… it has been a while since I saw something so good I want to go again. That said, here is a little #SundaySofrito for you. I want to preface this post by saying I have never been much of a theatre goer growing up. Most of the shows I have seen has been in support of my daughter Angelica, who recently graduated from FDU with a degree in Musical Theatre. Independently of that, I had the opportunity in the late 90’s to catch a play called ¿Quién Máto a Héctor Lavoe? that sparked my interest in independent productions. I also had the opportunity to see Latinologues (by Rick Najera) and countless indy shows thru my work with Capicu Cultural Showcase. That said… when I heard that “I Like It Like That” was debuting at the Puerto Rico Traveling Theatre with Tito Nieves (and my homegirl Caridad De La Luz) I got hype. Especially when I found out it was David Maldonado who produced the Hector Lavoe show. Fast forward to show night, I wanted to make the event a Daddy / Daughter date night with my princess and we had an amazing night listening to all the music on my Salsa Spotify lists live by this very talented cast. Full disclosure: I was invited by the PR Team to potentially review the show, however, this does not impact the integrity of my opinion about this wonderful production. I do not even know how to really review this show but by saying I was blown away. I was most impressed by the set design… so original and innovative, flexible enough to be both visually appealing / believable as it transformed from the streets of El Barrio, to a records store and a Salsa club. (shout out to Raul Abrego!) Tito Nieves kills as the lead as expected, but I was especially inpressed with Caridad De La Luz as China (a dynamic young activist ready to take back the streets of El Barrio) and Chachi Del Valle who worked a triple shift shuffling the roles of María Luisa, Babilonia and La Lupe, all very unique and very colorful characters that we all know in love in the lens of our life. The story takes you thru a very memorable time for Latinos in NYC where music ruled our hearts and shaped a legacy. The hardest part of watching this show was staying seated while Tito and cast sang the “dancetrack” of my life… maybe they should consider a dancing section. Without any reservations I recommend this show if you support the arts, love Fania music, love to hear our stories on stages that historically represent the best of what we have to offer and last but not least, are a Tito Nieves fan. You better hurry as his run for this show is quickly coming to an end. New York, NY– From the Producers of ¿Quién Máto a Héctor Lavoe?, Celia, and La Barbería comes the World Premiere of a brand new musical, I Like It Like That – A Musical for the 2016-2017 season at The Puerto Rican Traveling Theatre (304 W. 47 Street), previews begin September 7, and will celebrate its opening on September 22, 2016. The musical is written by David Maldonado & Waddys Jáquez and directed by Waddys Jáquez. I Like It Like That is the story of the Rodríguez family living in New York City’s East Harlem in the early 1970s, when music was the proudest expression of “El Barrio”. The production takes the audience on a historical musical journey amidst neighborhood volatility and social activism. Its residents deal with the ever-present pull between Escape and Social Conscience. The musical stars multi-GRAMMY award nominated Latin music superstar, Tito Nieves as Roberto Rodríguez, the patriarch of the Rodríguez family, who navigate through the challenges they face living in the heart of a volatile environment. Instilled in them is the importance of family and the desire to succeed. Co-written by theater, film & Latin Music industry veteran, David Maldonado, I Like It Like That will bring its audience back to an era when New York City was on the verge of financial collapse. Where music kept El Barrio’s soul afloat and became the religion of the masses. When Salsa singers and bands of the time became the community’s heroes and idols. Under Desmar Guevara’s musical supervision I Like It Like That features classics from era legends: Ruben Blades, Hector Casanova, Willie Colón, Pete El Conde, Joe Cuba, El Gran Combo, Hector Lavoe, La Lupe, Ismael Miranda, Johnny Pacheco, Eddie Palmieri, Tito Puente, Richie Ray & Bobby Cruz, Mon Rivera, Ismael Rivera, and Pete Rodríguez, and original songs by Bobby Allende, Pablo Garcia, Desmar Guevara, Waddys Jáquez, David Maldonado, Adan Perez, Victoria Sanabria and Michael Sotille. 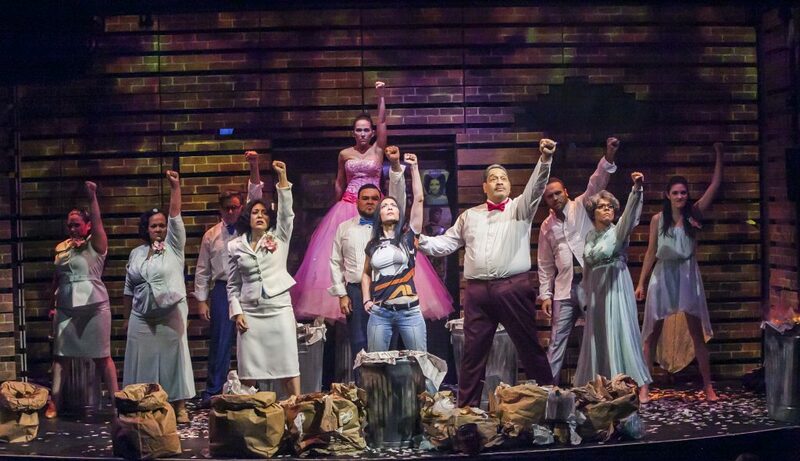 A stellar cast features Rossmery Almonte (Tita), Caridad De La Luz (China), Chachi Del Valle (María Luisa, Babilonia and La Lupe), Shadia Fairuz (Carmen), Quique González (Carlos), Ana Isabelle (Paula), Sofia Klimovsky (Understudy/Ensemble), Angel López (Rafa), Tito Nieves (Roberto), Yesenia Santiago (Understudy/Ensemble), and Gilbert Velázquez (Juan). The band includes Bobby Allende (Percussion), Anthony Carrillo (Percussion), Jorge Castro (Saxophone), Guido Gonzalez (Trumpet), Desmar Guevara (Musical Director/Keyboards), Jerry Madera (Bass), Hommy Ramos (Trombone). I Like It Like That’s creative team includes Raul Abrego (Scenic Designer), Lucrecia Briceño & Benjamin Swope (Lighting), Julian Evans (Sound), Rocco Disanti (Projection), Hochi Asiatico (Costume), Charles Bowden (Props), Rosalba Rolón (Dramatist). Written by David Maldonado & Waddys Jáquez. Directed by Waddys Jáquez, Musical Direction by Desmar Guevara. I Like It Like That A Musical is produced by David Maldonado, David Rodriguez and Juan Toro, co-produced by Pregones/Puerto Rican Traveling Theater, and Executive Produced by Cardenas Marketing Network (CMN).